Indiana Treeing Walker Coonhound Rescue View other Treeing Walker Coonhounds for adoption. Update: Bruce has been retured and is back up for adoption. Call,the number below if you are interested. Bruce was surrendered to Pals 4 Paws hoping they could find him a home. His dad could not take care of him any longer, or even himself. We were contacted because the rescue that had him has a hard time finding homes for Coonhounds. 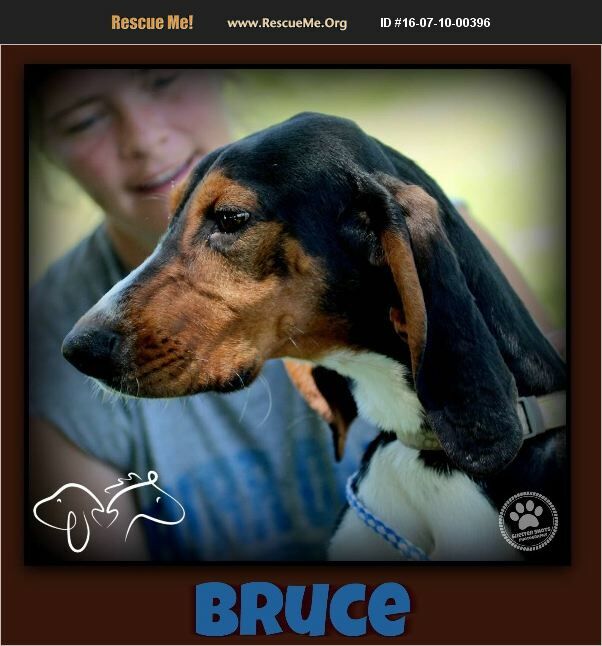 So Hoosier Hooves & Hounds took Bruce into their rescue. When Bruce got to our rescue he was in desperate need of some groceries. He weighed in at 32 pounds. He still needs to put on some more weight. That should not be an issue for Bruce, he does not turn down anything. He is crate trained, loves going for walks, he would do best in a home with no cats because he likes them a little to much. He does well with other dogs but keep in mind I am still a puppy & I do want to play with most other dogs i meet & not all dogs are so welcoming to that. He loves to play with tennis balls & chew bones. He is good with kids & loves car rides & does well. My adoption fee is $125.00.